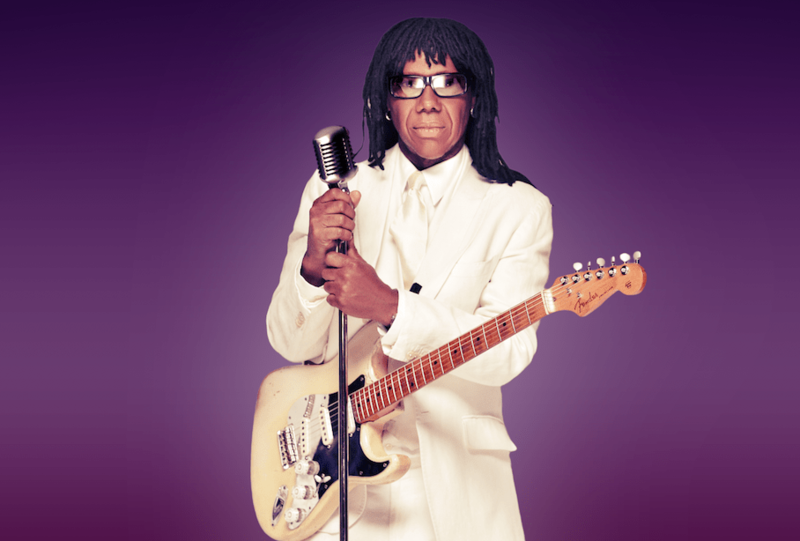 It’s been a long journey for Nile Rodgers from a dark upbringing in New York’s Lower East Side to the bright lights of music immortality. Raised in a family of junkies, and having experienced near-death experiences from drugs, drink and two cancer scares, he’s made the leap from the gutter to a life full of style, with a list of hits that have ensured his status in the hall of fame. Rodgers, who heads to Scotland at the end of the month, is one of pop’s great survivors who has enjoyed a half century of writing memorable songs and working with some of the industry’s leading figures. He has always considered himself a composer and organiser rather than a star and preferred the quiet back-of-stage role to the showy frontman. Even so, he was the unmistakable driving force behind his band Chic which embodied the disco sound of the 70s. Like them or not, their songs – Le Freak, I Want Your Love – are universally recognised. He and long-time writing collaborator Bernard Edwards, who died, aged 43, in 1996, also wrote the classic disco anthems We Are Family and Lost in Music for fellow disco champions Sister Sledge. Chic will be performing in Glasgow at the end of this month when Rodgers brings his first Fiesta x FOLD music festival to the city’s Kelvingrove Park with a line-up that includes luminaries of the disco era. The festival will feature 30 acts over two days performing to a 9,000 per day capacity with Nile and Chic appearing on both days. Organisers of Fiesta x FOLD are cranking up the retro factor as artists on the Saturday include Earth Wind and Fire and The Pointer Sisters. The two-day weekender coincides with the second TRNSMT festival across the city on Glasgow Green. Both events represent a fun alternative to T in the Park which ended in 2016 following deaths and crime related incidents. Fiesta x FOLD is aiming at a nostalgic party atmosphere and is expecting to attract fans of all ages and musical tastes. Full weekend tickets have sold out with just a few remaining for the Saturday event. An eclectic Block Party Stage will feature Huey Morgan (NYC Block Party Set), Maseo (De La Soul) and DJ Andy Smith of Portishead fame. Since he founded Chic in 1976 Rodgers has been a producer and collaborator with an A-list of artists including Madonna, Diana Ross, David Bowie, Duran Duran and more recently Lady Gaga and Pharrell Williams. He told an interviewer recently that his work on Let’s Dance with Bowie, who died of cancer in 2016, was his most important collaboration because it rescued both their careers. It was Bowie’s biggest selling album. He came through these troubled times because the family was also artistic and unconventional. His father was an accomplished percussionist. A lifetime in music appeared to be inevitable for young Nile if he could avoid the pitfalls around him. Ahead of his latest gigs he is expecting a big welcome from a city mourning the recent loss of two music venues but always in the mood for a great party. Fiesta x FOLD takes place on 30 June and 1 July. Nile Rodgers and Chic’s new album It’s About Time is out 14 September. The new single, Till the World Falls, is out now.